In recent years, large-scale natural disasters have frequently occurred in various parts of the world, and the associated losses have increased. As a result, there have been growing concerns over the protective measures needed, particularly with respect to energy and infrastructure systems within cities that are also experiencing mounting risks and exposure levels. In order to avoid risks and damage, and to strengthen resilience to natural disasters, national and local governments need to be prepared. At the local level, authorities must take action to construct policy packages that include locally based risk prevention facilities as well as risk finance and risk transfer systems. A proposal for the establishment of a risk management facility has been submitted by the Parties and other organizations to the United Nations Framework Convention on Climate Change (UNFCCC). The proposal by the Munich Climate Insurance Initiative consists of a three-tier risk management module for the international level, an international risk pooling mechanism for developing countries, an insurance assistance facility to cover medium-level risks, and a prevention pillar to achieve risk reduction. In addition to governments and private enterprises that offer financial support and the provision of necessary goods and services to cover losses post-disaster, risk financing and risk transfer tools such as insurance, reinsurance, and catastrophe-linked securities are key. Such tools help to reduce the negative economic impacts of extreme risks. This article discusses the risks associated with natural disasters, with particular focus on the vulnerability of energy systems. It examines the opportunities for local/community-based infrastructure to prevent risks through installing locally based energy systems, financing mechanisms to prevent risks and risk transfer systems as well as the associated challenges that exist with respect to their establishment. As Aekapol Chongvilaivan noted in his 2012 paper, natural disasters, such as the 2011 floods in Thailand, have had huge impacts on urban systems and their associated infrastructure. The nuclear power plant accident at Fukushima in Japan on 11 March 2011, a result of an earthquake and tsunami, highlighted the constraints of the existing energy system in Japan as well as its vulnerability to extreme events. Japan’s energy system is very centralized and dominated by ten regional electrical companies — according to data from Japan’s Agency for Natural Resources and Energy, about 90 percent of the country’s power generation. For example, electricity in the megacities of Tokyo and Yokohama is provided by the Tokyo Electric Power Company, which depended on nuclear power plants for 29.7 percent of its total generated electricity. The 2011 catastrophe increased public awareness on energy security, making it apparent that a review of energy security was necessary for the country, and that both a nationwide recovery plan and city-level recovery plans were needed. This has also emphasized the need for an innovative and resilient energy system with a diversified and decentralized energy supply and management system, including the development of more flexible, locally based energy supply and risk prevention facilities to quickly respond to risks. More than a decade has passed since the Kyoto Protocol to the United Nations Framework Convention on Climate Change (UNFCCC) was adopted (in 1997), which commits its Parties to reduce their greenhouse gas (GHG) emissions, thereby setting mitigation targets and related climate change policy at the national level. This has also prompted individual cities to do the same, oftentimes more successfully. For example, many local programmes and initiatives have been established in various countries, e.g., the Future City initiatives in Japan, Tianjin Eco-City in China, Thailand’s Low Carbon City pilot project and the Low Carbon Society project in Iskandar, Malaysia. In Japan’s case, these city-based developments were launched as part of the National Strategic Projects in its “New Growth Strategy”, published in June 2010. The New Growth Strategy policies (blueprint for revitalizing Japan) were set up as a result of a Cabinet decision in 2010. One of the components is “Revitalizing rural cities and towns by utilizing regional resources; revitalizing big cities to serve as engines of growth”. The targets to achieve by 2020 are to utilize regional resources to the greatest possible extent and to increase regional power, as well as to make strategic, prioritized investments in airports, ports, roads and other infrastructure in major urban areas. In consideration of natural disasters, which are expected to become more frequent and severe as a result of climate change, governments must be proactive and take a preventative approach to constructing resilient infrastructure and management systems within the city or community in cooperation with private and local non-profit organizations. Assessment of the damages of disaster risks and the costs associated with natural disasters ex-ante is also important. Therefore, for fully effective risk management and implementation, locally based facilities in line with an international risk management facility are needed. After the recent sequence of natural disasters in Asia — including the flooding in Thailand, earthquake in Indonesia, and earthquake and tsunami in Japan — and their severe impacts on society, city-based risk management has become a major focus, particularly in Japan, and has been added in the components of local development strategies for enhancing resilience at this level. In Japan, an “autonomous decentralized regional development model project utilizing regional renewable energy” was initiated in 2011. The project was implemented with additional funding of 1.0 billion yen in 2012. The budget was increased to 1.6 billion yen in 2013 under the programme of sustainable regional development (about 33 billion yen is planned to be distributed in 2013), according to the Ministry of the Environment budget request in 2013. The private sector has been a key actor in the implementation and has also included other players such as research institutions and local governments. In order for a decentralized, locally based energy system to exist, funding is required for the installation and operation of new facilities, such as solar power generation stations. In Japan, increasing attention has been paid to the establishment of such financial mechanisms as the result of raised public awareness on sustainable energy and security. Available funds have been identified through government subsidies, but cannot be fully relied upon, making it important to seek out other sources. Various local funds have been established through investments from the private sector and also from voluntary citizen donations. Financial instruments have included the issuance of certificates, promissory notes, and small-issue bonds through financial institutions. For example, a micro-credit fund is an investment fund designed to finance microfinance institutions (MFIs), which provide financial services such as small loans to small enterprises. MFIs deliver microcredit through local banking, solidarity groups and individual loans. In the case of Japan, for instance, after the Fukushima accident, the online retail investment fund management company (Music Securities Inc, Tokyo) set up new micro-credit funds to raise capital for small enterprises in the Tohoku region, which has been hugely affected by the accident. However, these instruments and methods vary and are dependent on the specific structures of funding within cities. A challenge for local low-carbon energy investment availability and feasibility is the high degree of uncertainty and risks inherent in renewable energy technologies. Uncertainty is high due to the lack of experience and history in the case of green energy and community-based projects, and the lack of understanding on the associated social and environmental impacts as well as potential economic benefits. Therefore, local government and investors who provide subsidies or invest in these efforts must utilize proper analytical tools to estimate the cost-effectiveness of the local energy project including any economic, social and environmental impacts of its implementation prior to any decision-making. In addition to the establishment of locally based energy systems, risk prevention or risk transfer systems mitigating the financial impacts of natural disasters must also be established at the local level. Agendas for the formulation of systems to reduce disaster risk and establishment of funding mechanisms, such as risk financing, have been attracting attention. Risk financing can be used to quickly secure funds before and after disasters, and also investigates countermeasures against natural disasters, including methods such as insurance and climate change adaptation measures. Economic loss attributed to extreme weather events around the world increases demand for the development of risk management and risk transfer schemes. 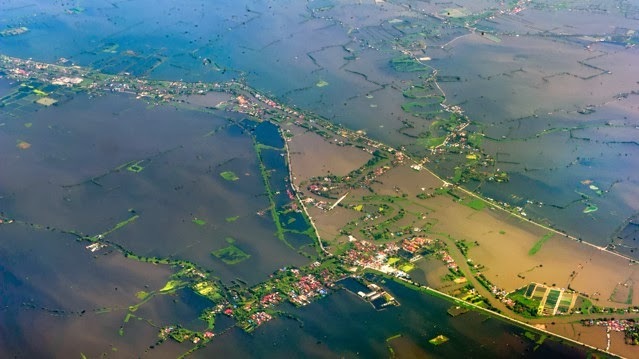 Many nations, including both developed and also developing countries, have established such insurance schemes that improve adaptation capacity to disaster events. One strategy to support the economic recovery immediately after a disaster includes a weather insurance index. This allows for the benefit of quick payment to aid in recovery post-natural disaster due to the parameters of the index (e.g., the wind speed of a hurricane or the degree of ground acceleration caused by an earthquake) rather than the actual damages that typically determine the conditions of payment. Use of these parameters aids in the liquidity of funding and helps insurees with more immediate recovery, as payments are paid as quickly as possible after the occurrence of disaster. When introducing such a risk transfer mechanism, challenges are prone to exist in the development, dissemination and design of the risk transfer scheme. Uncertainty is high when disasters occur in places that, in particular, lack appropriate infrastructure for pre-disaster management, lack data related to weather, or have unreliable data with respect to quality. Other challenges include residual risk (e.g., the exposure to loss remaining after other known risks have been countered, factored in, or eliminated), the uncertainty of unexpected events due to the inability to quantify events of rare occurrence, the inaccuracy/unavailability of climate data, or poorly designed risk-mitigation mechanisms and management systems. These are all of particular concern within developing countries where high residual risk results in high insurance premium costs that small enterprises and citizens in developing countries cannot afford. Therefore, for minimizing the residual and baseline risk, governmental support to cover expected losses and risk premiums, as well as to formulate reliable risk management mechanisms from accurate data (including compiled historical data and capacity development) is necessary. Moreover, the challenges to the development of disaster risk insurance are profound in cities of developing countries that are disproportionately impacted by natural disasters such as typhoons, floods and drought — usually exacerbated by high population density and inadequate infrastructure. These challenges usually stem from the weaknesses that exist in observation systems including quality of data, availability of data, weather observation stations, the automation of the weather observation system to record and compile the data at the local/regional level (not only at the national level), and ageing facilities and equipment. Therefore, for the improvement of risk prevention mitigation, first, the improvement of quality data and facilities to more accurately forecast and estimate risks is needed. The expansion, modernization and strengthening of a meteorological observation network is also necessary. Improvements in data processing are essential for the development of basic meteorological data for building a risk financing system, regardless of the field and approach of risk insurance or risk transfer mechanisms. A policy package to prevent natural disaster risks at the local level — including low-carbon infrastructure, risk assessment for investment and risk transfer systems — are needed. Future disaster preparedness requires the establishment of risk financing systems. It is necessary to have not only locally based infrastructure systems such as community-based energy management and supply systems and financing mechanisms, but also risk transfer mechanisms including risk insurance for natural disasters. In addition to the establishment of these systems at the local level, a basic infrastructure of data for risk assessment and estimates is required, and also a strengthening of regional or informational cooperation between cities or countries across both the developed and developing world. Finally, it is imperative, as in the case of Japan, to develop and build a collaborative environment for public institutions and private companies for the success of these locally based initiatives. Khi mang thai người ta thường quan tâm :thực phẩm bà bầu nên ăn trong 3 tháng đầu.khi mẹ bầu bị ho thì nên sử dụng loại thuốc nào? tri ho cho mẹ bầu ra sao?.Xem thêm tại website: http://lamthenaodetranhthai.blogspot.com/.